Members of Professor Milad Abolhasani’s research group and their off-campus colleagues have developed a microscale flow-based, high-throughput screening technology that offers a faster, safer and less expensive means of identifying optimum conditions for performing high-pressure/high-temperature catalytic chemical reactions. The technique focuses on hydroformylation reactions, which are used to create a variety of commercial products. The new technique uses extremely small samples – on the order of 11 microliters, rather than the milliliters used in conventional techniques. The technique also integrates reagent preparation, reaction processes and analysis into a single sequence. An explanatory video regarding the work is available here. “Ultimately, developing a more efficient technique for these reactions is important because it expedites R&D, allowing researchers to both improve manufacturing processes and to accelerate industry’s ability to identify new ligands that have commercial applications,” Abolhasani says. 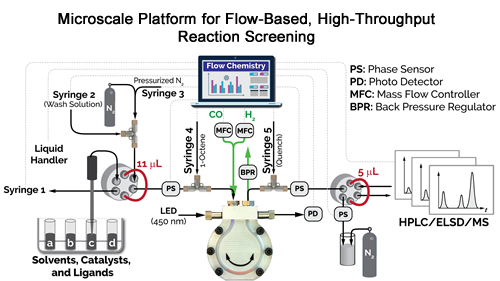 The paper, “Flow Chemistry-Enabled Studies of Rhodium-Catalyzed Hydroformylation Reactions,” is published in the Royal Society of Chemistry journal Chemical Communications. First author on the paper is Cheng Zhu, a CBE postdoctoral researcher. Co-authors include Keshav Raghuvanshi, a CBE postdoc; Connor Coley of MIT; and Dawn Mason, Jody Rodgers and Mesfin Janka of Eastman Chemical Company. Eastman Chemical Company funded the research. Except for particularization to CBE, this article was written by Matt Shipman, Research Lead in University Communications at NC State.